On 2 Dec. 1879 William Briggs of Stoughton, Massachusetts, received a patent for arithmetical calculator (US patent 222126). 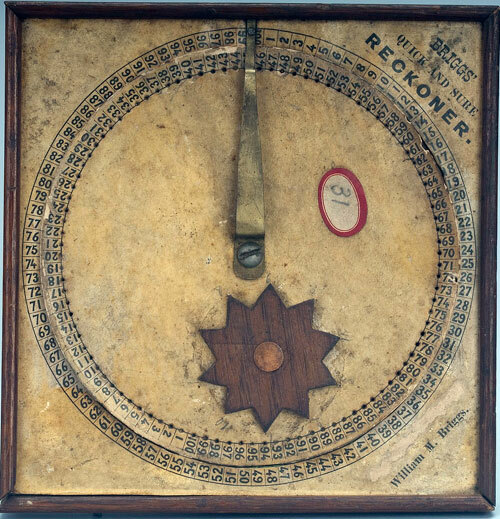 The patent model of the device (up to 1880, the US Patent Office required inventors to submit a model with their patent application) is still preserved in the National Museum of American History, Washington, D.C. (see the image below). The calculator of William Briggs is a wood, metal and paper device with overall measurements: 2.2 cm x 15 cm x 15.4 cm. The calculator of William Briggs is an adder with a square wooden frame. On top is a piece of paper printed with the numbers from 1 to 100 and a rotating tin disc. The disc has 100 holes and is covered with another piece of paper, with the digits from 1 to 100 printed around the edge. Atop this disc is a second, smaller wooden stellated wheel (disc) with 10 serrations around the edge. The carry mechanism is implemented by means of a fixed metal arm which reaches over the 100 disc on the outside paper. This arm advances the smaller disc at every rotation of the larger disc. Briggs suggested that further wheels could be introduced to indicate thousands, ten thousands, etc., but he didn't include these wheels on the simple wooden and paper model he sent to the US Patent Office. Who was the inventor William Briggs? William M. Briggs was born in 1813 in Connecticut. He lived in Norfolk County, Massachusetts (Sharon and Stoughton towns, south of Boston), working as a farmer and miller. William Briggs was married twice: to Rebekah C. Briggs (1810-1851) and then to Elizabeth C. Briggs (1828-1899). He had at least 5 children, between them: Emma (b. 1850), Frank (b. 1855), and George (b. 1858). 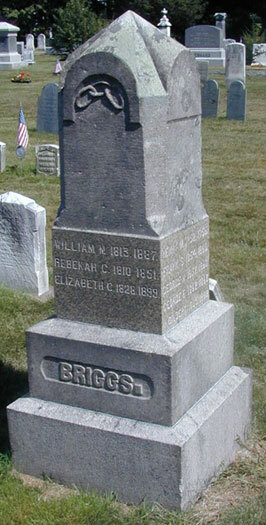 William Briggs died in 1887 in Stoughton, Massachusetts (see his headstone below).